Localisation and context | Another dot in the blogosphere? Today and tomorrow I link my Wireless@SGx experiences with the educational technology anecdotes of Singapore schools and institutions. 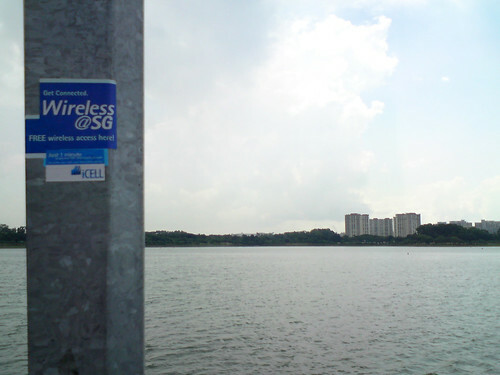 For the uninitiated, Wireless@SG is a wifi-hotspot network in Singapore. In theory, anyone — resident or visitor — can register to access the Internet for free with their own mobile device at malls, libraries, cafes, train stations, etc. Wireless@SGx is a variant that is supposed to be more secure and can be tied to your mobile phone number so that you do not have to login at hotspots. This is very convenient in principle. For the regular user, however, the practice can be a mixed bag. I frequent a neighbourhood library to get work done. I have found that I can connect quite reliably to Wireless@SGx on my phone, iPad, Chromebook, or MacBook when I am in the third floor study area. I prefer the study area on the first level because it is more convenient and beside a cafe. However, my devices struggle to connect to the same network and I resort to tethering my laptop to my phone when I am there. My guess is the clinic next door and one the same level has another Wireless@SGx hotspot that somehow interferes with the library signal. In short, I can travel just two floors in the same building, but have very different connectivity experiences. Occasionally I travel to a larger library just a few train stops away. This library seems to be a good wifi signal on every floor. However, when I walk across the road for coffee at a cafe that also has Wireless@SGx, my access seems to depend on a flip of the coin. Heads, I have access; tails, I do not. What does this have to do with the educational technology scene here in Singapore schools and institutions? I am not referring to the infrastructure or the woes that schools have with official networks, segregated wifi, and alternative access. I am referring to grand plans and standards that, in theory, are very different from the way they are interpreted and implemented in different contexts. Like it or not, schools cannot share “best” practices because what works in one is not likely to work in another. The contexts are different. Some ideas might transfer where the differences are small. They certainly do not when the differences are large. Like it or not, schools need to find their own way by making mistakes and learning from them. Like it or not, the stories that are told by the press or official communiques that are released are often sugar-coated. They do not reveal what is most important about the educational technology implementations — the mistakes — because this looks bad. We need to read accounts of visitors to our system, as well as official pieces and articles by local papers, about technology enhancements in classrooms with a shaker of salt. This is not to say that the today’s classrooms are not different from one a generation ago. They are in terms of expectations, mindsets, and some behaviours. Anecdotes do not a system make. In the best case, they enlighten. In the worst case, they misinform. I elaborate on one such anecdote tomorrow.